If you sign up to a website using your mobile phone or send an SMS to a mobile number, you may become a victim of fraud. You may find that even after sending a payment, you don't receive the promised service, or that a small amount is regularly debited from your account. Yandex Browser tracks fraudulent sites and blocks them within the Protect integrated security system. The situations described below may occur if you visit fraudulent or infected sites (please note that a website that was secure yesterday may be infected today). They may also be the result of malware on your computer. The site asks you to enter your mobile phone number under various pretexts. For example, the site asks for your number to register on the site or to prove that you are not a robot, to activate software updates, to prevent your social network account from being blocked, and so on. You receive an activation code on your phone and are asked to enter it on the site. By entering the activation code, you activate a paid subscription. A small amount of money starts being deducted from your phone account every day, usually 20-30 rubles. You are asked to send a text message (SMS) from your mobile phone to a number shown on the site. You send the text message. The cost of sending the message is higher than the normal rate to send an SMS. In addition, the website may not contain any information on prices, or this information is hidden away in an unnoticeable location on the site. Immediately after the SMS is sent to a mobile telephone number, your mobile phone account will be charged a certain amount, usually 100-200 rubles. In some cases, money starts being withdrawn on a daily basis. Yandex keeps track of sites linked to SMS fraud and stores their addresses in a special database. 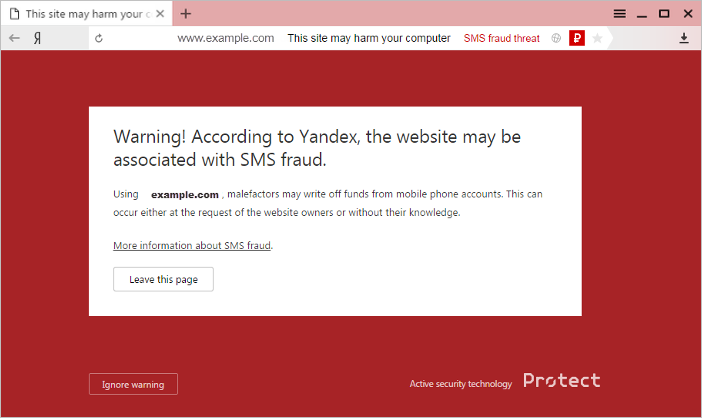 If you try to go to a site linked to SMS fraud, Yandex Browser blocks the dangerous page and informs you about this — a message appears in the browser window, and the icon will appear on the right of the SmartBox. If you do, you will be asked to perform actions that will result in money being debited from your mobile phone account. There might not be a message warning you that a fee is charged for using the service, or the message may be difficult to find. It is likely that you will not receive the services you paid for at all or they will not be delivered exactly as promised. Do not enter your mobile phone number on sites that you do not completely trust. Do not send messages from your phone to numbers shown on websites. Avoid transferring any personal data or data required for e-payments (bank card numbers, PIN codes etc.). Attention. If you want to disable protection against SMS fraud, you will have to completely disable protection against malware and malicious sites in the browser. We strongly recommend that you don’t do this. Follow the same steps to re-enable SMS fraud protection. If you think that your website was mistakenly included in the list of websites suspected of SMS fraud, please follow the instructions on the SMS fraud page.